Excited about Spring Break 2013 yet? Believe it or not, marketing and promotions teams are already planning for it, and with good reason. Known as the “Spring Break Capital of the World”, Panama City Beach has annual attendance numbers exceeding half a million students, making it the most attended Spring Break destination in the world. Planning for an event as massive as a Panama City Beach Spring Break doesn’t just occur over night, and that’s why the buzz has already begun. Multiple planned events are in the works such as huge celebrity events, FREE concerts on the beach, and internationally renowned DJ’s performing at Panama City Beach’s hottest night clubs. 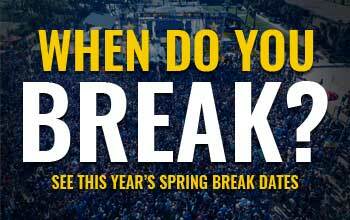 Students may not ‘officially’ begin their Spring Break 2013 plans until the school year starts, but rest-assured, planning is in the works for what will once again be the year’s biggest student party. For continuous updates and interactive discussion on what’s happening and what’s in the works for #SpringBreak2013, follow the official Twitter handle for Spring Break in Panama City Beach @springbreakpcb and join the conversation on Facebook. And as always, you can stay on top of all the news by visiting the Official Spring Break Website http://www.pcbeachspringbreak.com.